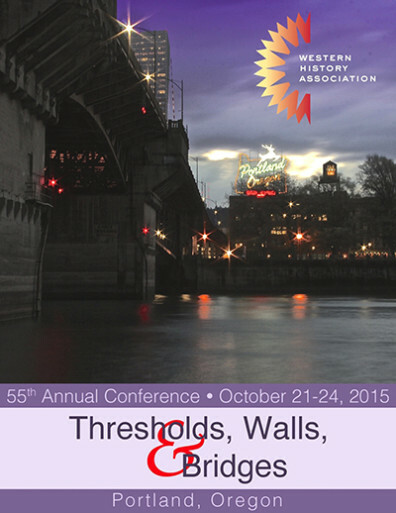 The WSU history department had a huge presence at the 55th Annual Conference of the Western History Association, held in Portland, Ore., October 21-24, 2015. In addition to major financial support coming from the department, the Columbia Chair, and the Claudius O. and Mary W. Johnson Fund (in cooperation with the Clark County Historical Society), Prof. Peter Boag served with Katy Barber (PhD ’99) as co-chairs of the Local Arrangements Committee (LAC). LAC members also included Profs. Laurie Mercier and Steve Fountain from the Vancouver campus, Prof. Emerita Sue Armitage, and former WSU graduate student Tim Hills, who works as a historian for McMenamins Pubs, Breweries, and Historic Hotels. WSU history professors and former graduate students who gave papers, chaired sessions, commented on presentations, and even led tours at the conference were Barber, Boag, Jennifer Brown (PhD ’12), Robert Bauman (Tri-Cities), Fountain, Lawrence Hatter, Hills, Kevin Marsh (PhD ’02), Mercier, Jackie Peterson (Emerita WSUV), Jeffrey Sanders, and Jennifer Thigpen. Current WSU PhD student Gregory Atkins gave a paper titled “Creating the Western Resort City: Boosters and Their Use of Religion in Colorado Springs, 1871-1909.” WSU PhD student Brian Stack received the WHA Graduate Student Prize (which made possible his participation in Portland), and MA student Jason Hogstad received funding from the WHA and the Columbia Chair that allowed him to attend and assist at the conference. Other current and former WHA graduate students seen about the conference included Hans Petter Grav, Carey McCormack, Sara Dant (PhD ’00), Mark Fiege (MA 1985) and Laura Woodworth-Ney (PhD ’96). 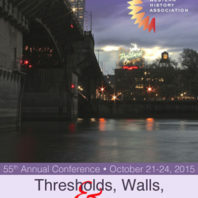 WSU faculty from other departments who participated in the conference were Profs. Luz María Gordillo (Vancouver) and Linda Heidenreich.